Periodontal plastic surgery procedures help to strengthen thin, and weak gum tissue. The treatment also enhances the aesthetic appearance of the soft tissues and improves your smile. A periodontal plastic surgery includes soft tissue grafts and esthetic crown lengthening. If your teeth are too short and your smile looks too gummy, or if your gums cover too much of your teeth leaving some teeth with the right length, lengthening of the Dental crown might be the right solution for you. This procedure involves the removal of excess Gum tissue to expose the crown of the tooth more. The gumline is then sculpted to give your smile a right look. Periodontal diseases cause gum recession. Gum recession weakens the teeth roots resulting them to be more exposed. This makes the teeth look longer than your bite. 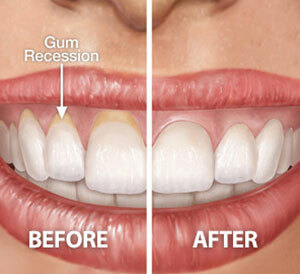 Although gum recession is caused due to periodontal diseases, there are other reasons which lead to gum recession. Gum graft surgeries and other root covering procedures can cover exposed roots, to reduce further problems. These treatments also protect weak roots from decay.